"We support businesses by realising lasting change and improving their behaviour when confronted with renovation." In a globalised world, change and adaptability are key success factors for companies. Such a need for change is often driven by so-called digital technologies such as data analysis, the ability to connect individuals and things or blockchain technology. Within the scope of a strategic realignment, this change not only leads to new services and business models in the company, but also to fundamental changes in structures, processes and behavioural patterns. In the event of such far-reaching changes, the Business Transformation division speaks of a transformation: a strategically founded, significant change of patterns affecting central processes of value creation and the basic business activities of a company, realigning them and fundamentally transforming them. In this context, the field of business transformation deals with the strategies, phenomena, processes and methods of transforming companies in the digitally networked economy and addresses the question of which methodological foundations must be created in order to explain and successfully shape the digital transformation for companies. 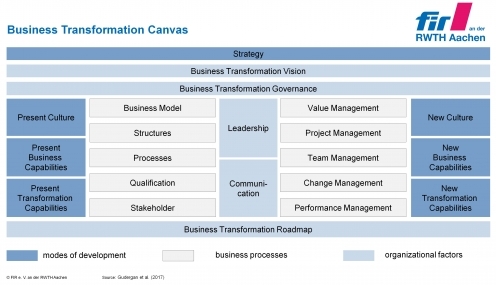 The basic framework for the structured management of a transformation is provided by the Business Transformation Canvas, which has been developed in-house and has already been tried and tested many times. From a process-related perspective, this canvas provides an orderly framework with the essential fields of activity in transformation projects. The procedural perspective on which the regulatory framework is based is supplemented by three thematic areas which explicitly focus on shaping the company of the future in the digitally networked economy. These three topics include "Ecosystem Design","Strategic Business Analytics" and "Digital Leadership". The question of what will be the company of the future is particularly relevant for the strategic positioning of companies and can be an impulse for a company transformation as well as the basis for the conceptual design of the transformation. The models and logics of value creation in companies are subject to significant pattern changes in the course of digital transformation. Increasingly, platform-based business models are being developed, creating ecosystems that break down the previously known chain-like logics of value creation and reorganise them into network-like structures. We are engaged in the development and selection of adequate corporate strategies to realize pattern changes in the course of digital transformation and to reduce the uncertainties associated with the entry into platform economics and the design of ecosystems. In addition to questions of monetization, these include issues such as institutionalization, openness and access, governance and regulation, as well as the measurability and scalability of ecosystems and platforms. The use of data in the course of improving the competitive position by optimising and thus increasing production is a well-known topic. However, the potential of using data analysis methods goes far beyond significant productivity increases of existing organizational systems. For example, the use of analyzed data can open up completely new business areas for companies that require a re-institution of the company's purpose and give the company a new competitive position. On the one hand, managing the goals of increasing productivity in the existing value creation model and on the other hand, creating completely new models is one of the greatest strategic challenges for companies. In the context of this challenge, the focus of the Business Transformation division deals with the question of what role advanced Business Analytics processes have in the sense of a new core competence of companies for repositioning in the competition and how Business Analytics has to be designed as a concrete, strategically relevant capability. This research area deals with the management of the transformation process as such and focuses on questions concerning the design of the leadership system in the context of a digital transformation. The process, from the transformation strategy to the development of a vision to the design of an implementation roadmap, is understood as a comprehensive change process that places high demands on leadership skills and leadership behavior. The focus of interest is to a large extent on the influence of behaviour. In addition to the strategic patterns of change that accompany the design of platform-based business models, ecosystems and the use of business analytics in the sense of a strategically important capability, fundamental assumptions and perspectives, leadership structures and styles as well as forms of communication play a decisive role in the transformation of companies. Using methods such as design thinking can be used to initiate a change of perspective. The focus here is on changing the behaviour of leaders and employees. For this reason, in the field of "Digital Leadership" we work on the conception and use of suitable models and instruments to adapt the behaviour of individuals and the organization as a whole. Methods such as the transformation readiness assessment or the transformation canvas can be used to develop concrete implementation plans for the effective implementation of changes.